by Andre E. Johnson, Ph.D. I discovered Henry McNeal Turner by accident. While starting a seminar class in rhetorical criticism and trying to hone in on a dissertation topic, I ran across a speech delivered by Turner. 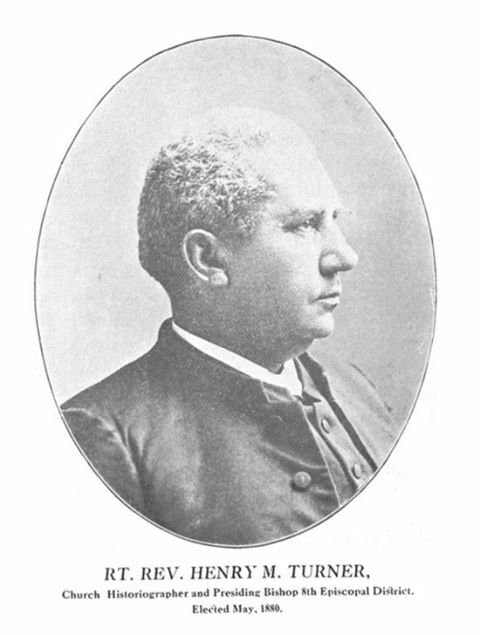 He delivered the speech on the floor of the Georgia House of Representatives as the House debated whether African Americans could hold office in the state of Georgia. I remember reading the speech and wondering if anyone had studied Turner’s rhetoric. However, there was a problem. Since Turner lived during the nineteenth and early twentieth centuries, it was my belief that texts from Turner would be difficult to find. Turner, like many of his contemporaries during this time, spoke extemporaneously—not from notes or prepared texts. Moreover, unlike some speakers during this time, Turner did not travel with a stenographer—or someone who could have written what Turner said for later publication. Going into my project, I only hoped there were enough texts to do a solid dissertation. Imagine my surprise when I found that Turner was one of the most prolific writers and speakers during his time and that much of his writings were not lost to history. Turner published copious amounts of material for newspapers, magazines, and journals of his day. Turner lectured throughout the country and wrote extensively on his travels to Africa. In short, many would consider Turner a public intellectual in today’s definition of the term. Sadly, many today have not heard of Turner. Indeed, it is as if Turner has been lost to history. I found myself always explaining to people who Turner was and why I thought, at least, he was so important. This is why this site exists. It is our intent to recover a lost voice within American and African American history. Henry McNeal Turner deserves recognition and it is our fervent hope that this site begins to serve that purpose. Andre E. Johnson, Ph.D. is currently an Assistant Professor of Communication at the University of Memphis. He teaches in the areas of Rhetoric and Religion, Rhetorical History, and African American Public Address. He also is currently Senior Pastor of Gifts of Life Ministries an inner-city church built upon the servant leadership philosophy. Dr. Johnson has a Masters of Divinity degree and a Doctor of Philosophy degree in Communication. He is currently editing The Literary Archive of Henry McNeal Turner and has published the first six volumes under the title: "The Literary Archive of Henry McNeal Turner." Dr. Johnson is also the author of The Forgotten Prophet: Bishop Henry McNeal Turner and the African American Prophetic Tradition, (2012) that won the 2013 African American Communication and Culture Division Outstanding Book Award. He is the editor of Urban God Talk: Constructing a Hip Hip Spirituality (2013). He also serves as Founder and Managing Editor of the popular Rhetoric Race and Religion Blog and as general editor of the Rhetoric Race and Religion book series with Lexington Books. His latest book, co-authored with Amanda Nell Edgar is titled, "The Struggle Over Black Lives Matter and All Lives Matter." For more about Dr. Johnson click here. Web Designer: Amanda Nell Edgar, Ph.D.
Michael K. Turner, Ph.D.- Associate Professor of the History of Christianity and Wesleyan Studies, Memphis Theological Seminary.